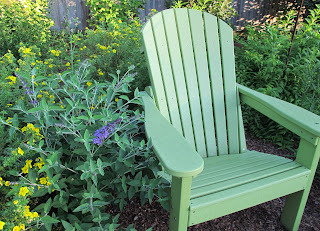 Welcome to Garden Bloggers' Bloom Day for July 2013. Here in my USDA Hardiness Zone 6a garden in central Indiana, I rejoice this summer for all the rain and "normalness" we've had, weatherwise. As many others experienced or recall, last year was the hottest, driest summer we have ever lived through in this part of the United States. It set all kinds of records that I hope never to see broken. My bloom day post for July 2012 shows a pathetic lack of blooms. This year the garden is blooming and showing all kinds of blooms in mid-summer. Shall we take a walk around the backyard and see what we can see? Please ignore all of the weeds, tree seedlings and general lack of deadheading, as this has also been a busy summer, and I was on vacation out of town for ten days just a week ago. We'll step off the patio, past this container which contains a banana plant and some vinca. 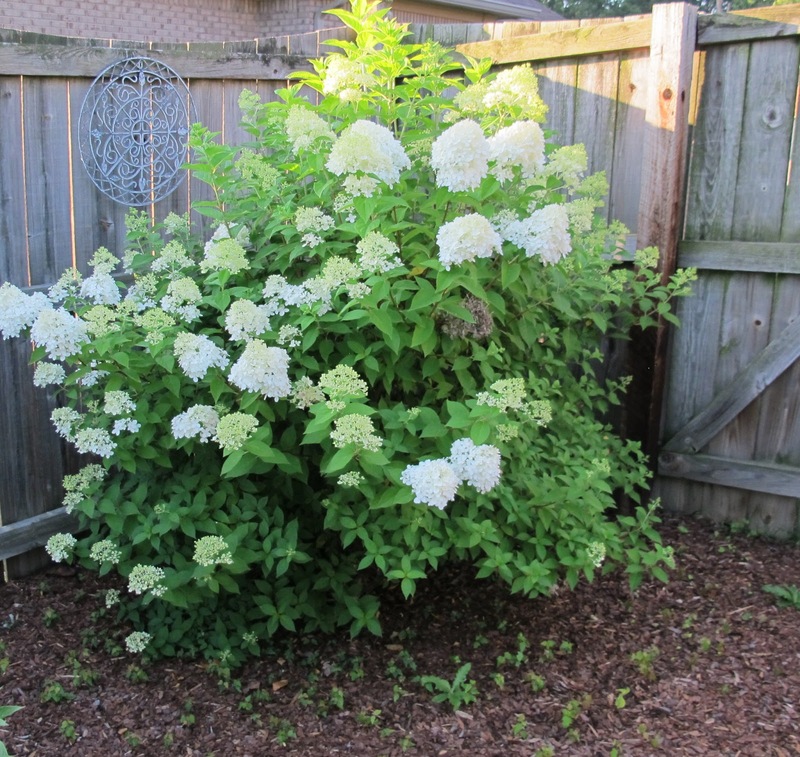 In the corner of the fence, a hydrangea is beginning to really bloom. I need to put something around her, just to keep her company and to crowd out those weeds. We'll head down a path now called Ridgewood Avenue where we can see the "backside" of the August Dreams Garden border. 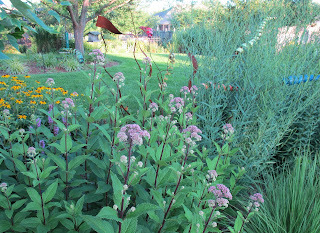 The joe-pye weed is beginning to bloom, already! 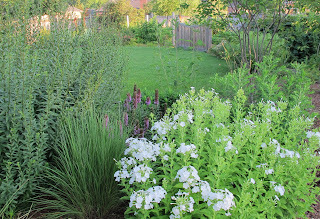 Further down, a tall white phlox is showing its stuff. We'll leave this border now, and head over to the Vegetable Garden Cathedral. The first thing you'll smell and see is the dill. It's tall and setting seed. I need to cut that back or I will have a garden full of dill seedlings next year. That's the nice thing about dill. Once you plant it, if you let it go to seed, you will have dill for the rest of your life. That's also a not very nice thing about dill. Elsewhere in the garden, the corn is tasseling. Those aren't the prettiest flowers, but they are a sign of some sweet corn that I will surely be picking in another week or so. Leaving the vegetable garden,we come around to another garden border called The Shrubbery. This was planted last year and the year before, and this year the entire area has been growing and filling in. Next to my chair is a dwarf blue butterfly bush and some potentilla. That potentilla has been blooming all summer long. No time to rest, we are coming up now to Plopper's Field. 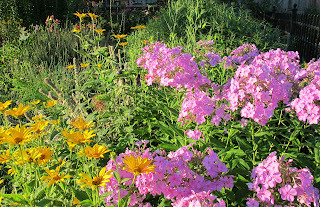 Pink tall phlox and variegated ox-eye daisies are competing for brightest color on the edge of this garden border. The main section of the border shows just how "full" Plopper's Field has become. It also shows that I have not been diligent in dead heading flowers. 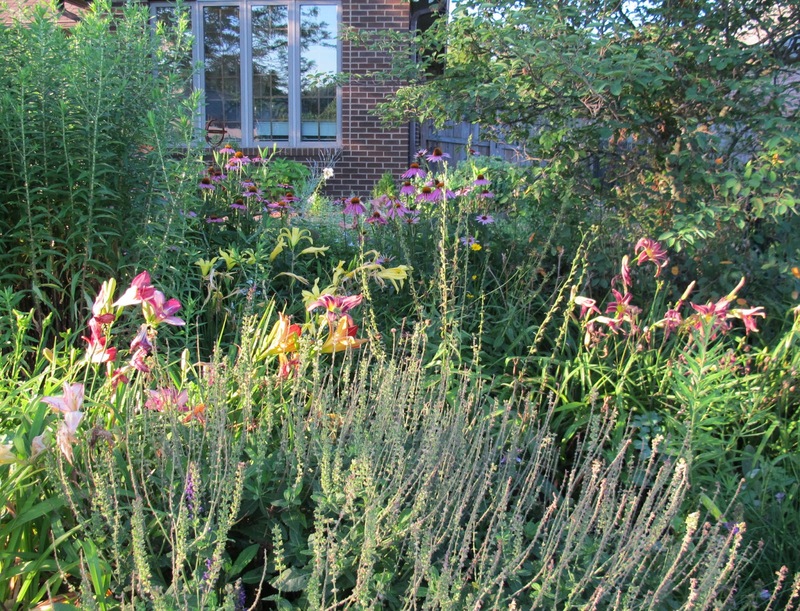 Please look past the seed heads of the salvia and see the pretty daylilies. 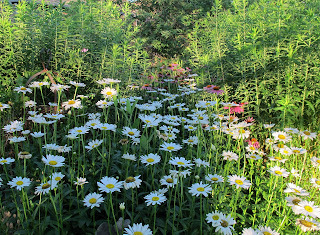 Or walk around the border and see the daisies and coneflowers. 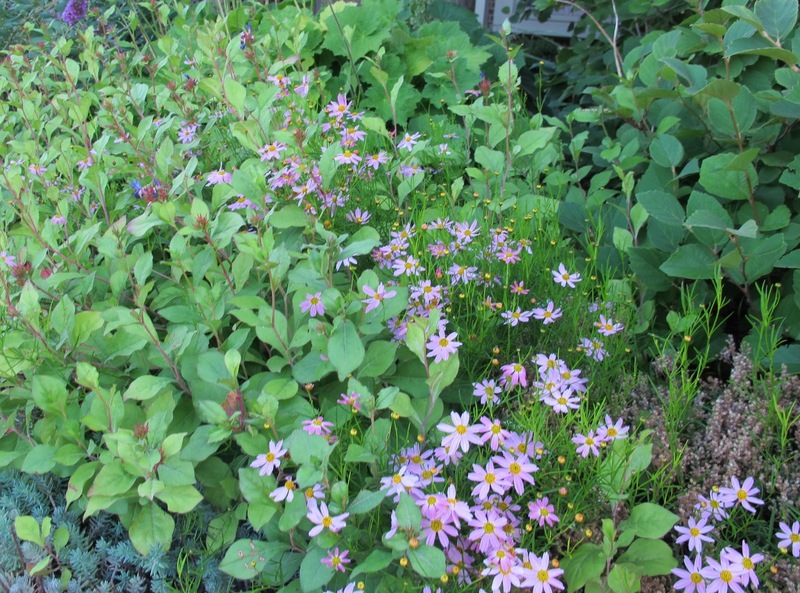 They are flanked by tall Michaelmas daisies that I did not have time to cut back in late May so they wouldn't get so tall. Oops. Now we'll see how floppy they get in September when they bloom. One more view of Plopper's Field from the other side. I should title this bloom day post "I'll show you my mess of a garden if you show me yours". I see weeds everywhere. 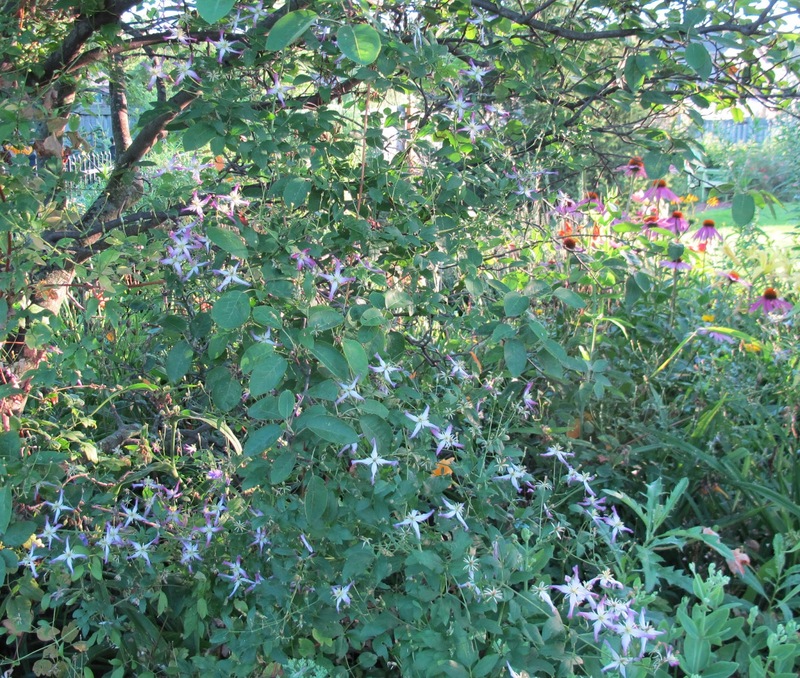 I also see a clematis scampering through the serviceberry tree on the corner of Plopper's Field. This clematis has scampered its way to the top of this tree, which is about 15 feet tall. I tried to get a picture of it, but my photography skills would not allow it. Let's go around to the front garden to see some blooms there, too. I long ago ripped out most of the pansies and violas, but left this container of them because they didn't look half-bad. They are still doing well, even though it is summer time. They probably didn't get the message that pansies don't do well in the summer time. Now that they've gone this far into the season, I'm going to keep them going for as long as I can. On the other side of the sidewalk, in a border I have yet to name, some pink coreopsis self-seed themselves around every year and I just let them be. Those bigger leaves are not their leaves, by the way. They belong to another plant, leadwort. There are other flowers to see, but nothing else too exciting in the front, where the theme is "let's not go all wild so they think a crazy gardener lives here". We'll return to the back where we started, and admire the black-eyed Susan's in August Dreams Gardens. We can stand here and talk about how green the lawn is, how plentiful the rain has been, all my weeds, or you can show me what's blooming in your garden. 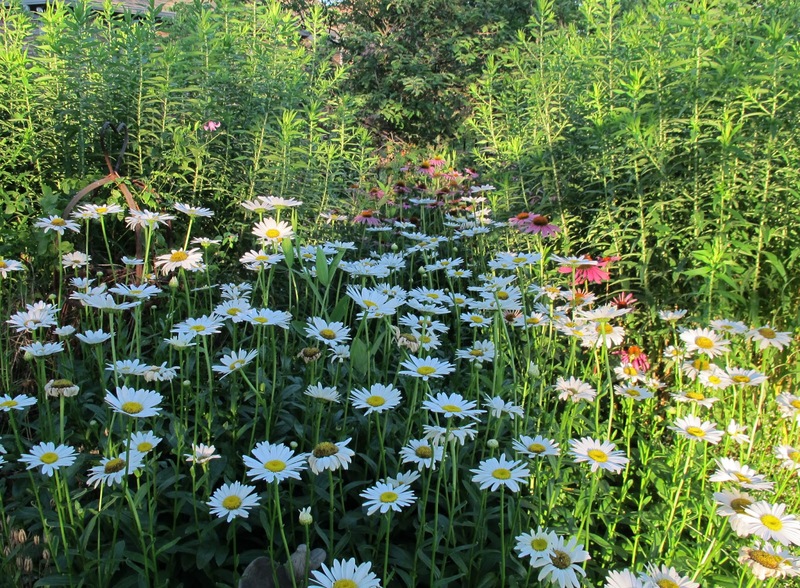 What is blooming in your garden in mid-July? I'd love to see and read about whatever it is that brightens your garden on the 15th of every month. Love that banana plant in the container...very nicely done. I still have a little bit of dill, but the rabbits seem to like it as much as we do. Thank you for hosting. How lovely to hear you have a 'normal' summer! Over here in London we have an unusually nice summer for a change :-) Loved the stroll around your garden, thanks for hosting the GBBD again! Your gardens are looking great and so full of color. For a spring and summer with a slow start the gardens have certainly caught up and are ahead of schedule here on Long Island in some cases. 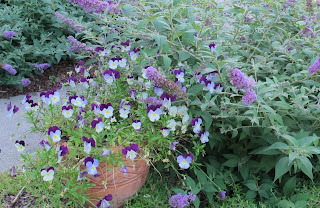 Thank you for hosting another Garden Blogger's Bloom Day-such fun seeing all the blooms! Thanks for this nice walk. Your garden is beautiful and very lively. Happy GBBD! Happy GBBD! It's very hot and humid here in Japan, so I have a few plants flowering now... Your garden looks gorgeous!! Especially love the Clematis"Rubromartinata", they are lovely! Thank you for hosting!! Your garden looks as beautiful as ever! Lovely to see how your garden has filled out so much Carol. Mine in Scotland is now ahead of schedule compared to the last 2 GBBD July postings. Your garden is looking great! So nice to see it lush again and getting rain. Happy GBBD and thanks for hosting! Thanks for hosting. I'm thankful for all the rain too! So glad you are having a "normal" summer this year and not a repeat of last year!! Looks like you've got lots of good stuff going on in your garden this month. Thanks for hosting GBBD once again! Love your hydrangea. Brand new H. paniculata 'Limelight' in my garden is putting a smile on my face with it's beautiful blooms. Thanks for hosting Bloom Day! 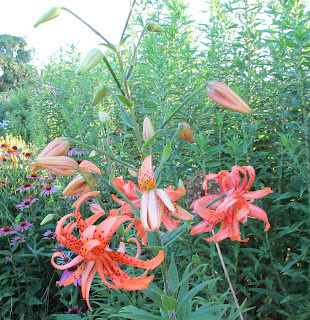 I did not know there were Double Tiger Lilies - really wonderful! I am glad you are getting some rain this summer, we are too, but we have been fortunate to dodge the flooding others in the South have gotten. 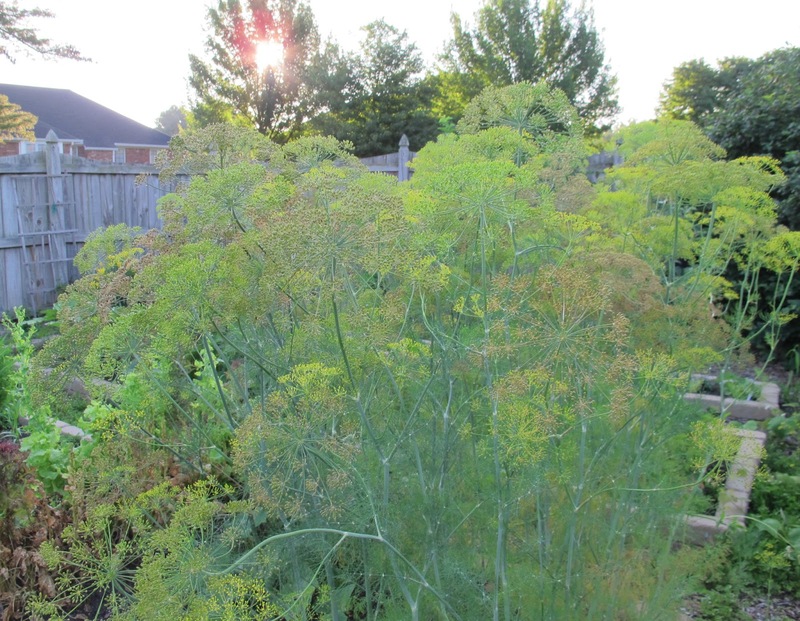 If you ever plant fennel, follow the same advice you gave us on the dill, it sure can be weedy. Thank you for hosting yet again, and happy GBBD! I have to say I am very envious of your dill. It would seem that I have a lot to learn about the positioning of this herb. This year I have sown it with the protection of a north facing wall only to find that the wind has hit the wall and flattened it all. 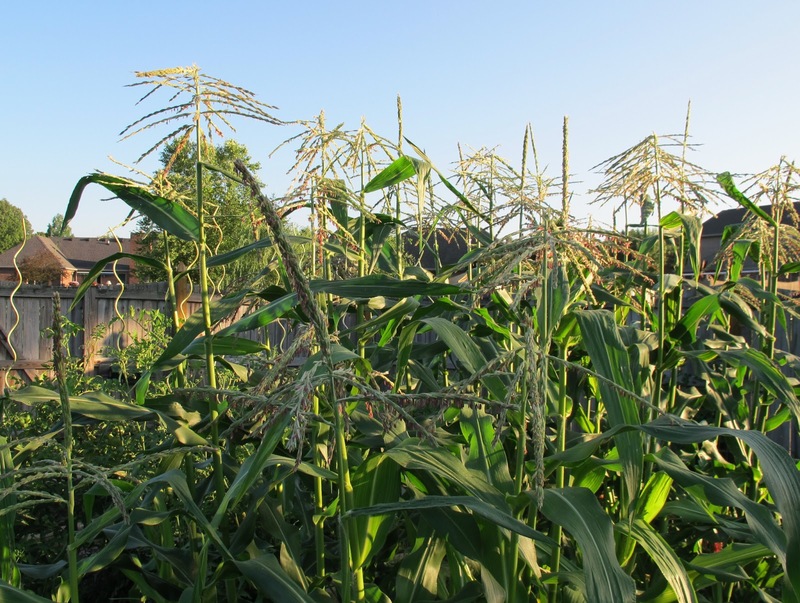 Hard to believe it is July 15th already...your garden is in such lush bloom even the tall corn. Your garden is looking lovely, I've been in Hydrangea envy ever since freakish cold snaps killed all mine, so today I bought a blue lacecap one that is supposed to be hardy to zone 4, so I hope I can keep enjoying it. I'm happy with you for the return of your rain. Hello, from rainy Alabama! My gardens looked a bit neglected this month thanks to a huge project that I have been working on for 8 months.. Your garden is looking really full with gorgeous flowers everywhere. I envy you your rain, we are desperate for some, last year it was non stop rain, this year it is non stop sun and heat. Your garden is ahead of ours, maybe we will catch up one day, my phlox are only just starting to form flower buds. Can't believe you have pansies still going especially since you were gone while it was quite hot and dry. Nice plants. Happy GBBD. I love the way your chair blends with the colours around it. Thank you for hosting. It's been awhile since I've stopped by and linked here. I had just the post to do so. Thanks to Serenity Cove for reminding me. Carol, Your garden looks fantastic...Happy Bloom Day! OOh beautiful flowers! Please do not call the Banana common, it is very attractive and elegant looking and gives that tropical touch to a garden. Your corn looks lovely, I can't grow because of bugs and monkeys. Have a great week Carol. Your garden is looking so lovely Carol. If it makes you feel better about the weeds, I have some that are taller than me.. But rusty duck is a garden under renovation, so I keep telling myself that makes it all right. It does, doesn't it?? Thanks for hosting this, May! I have a number of things in bloom that you do (hydrangea, lilies) but you are ahead with others. My phlox are not yet ready. I adore dill so I do let some of mine go to seed. Nothing more delicious than lettuce, tomato, cuke, peppercorn ranch dressing and dill :) The perfect summer salad. I love whatever that garden ornament is! It's fabulous. Garden designer here: The hydrangea is Limelight, a variety of hydrangea paniculata. Annabelle has the big round mopheads; Limelight has more cone-shaped panicles. 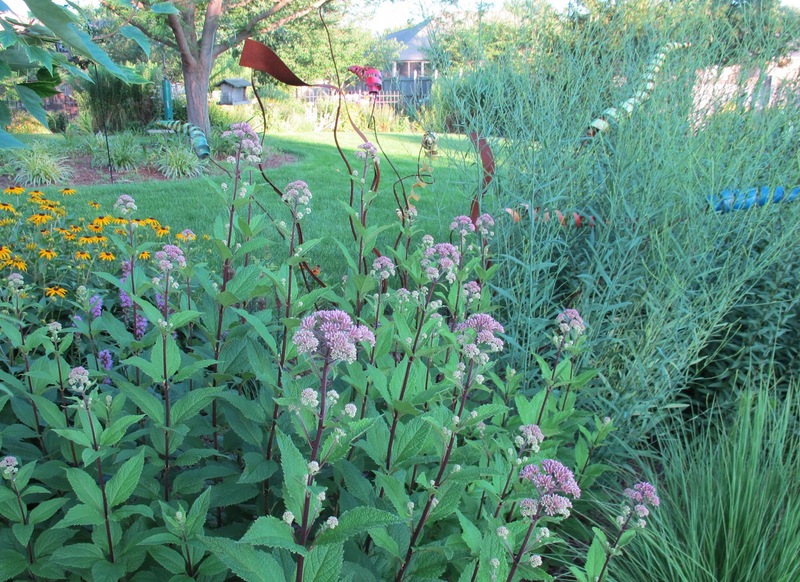 Your garden looks great; no need to apologize for weeds which just calls attention to the wrong thing. We're grateful for daily rain, refilling the aquifer so we can water in dry September. Love your garden. I have many of the same plants blooming in my garden. all of my hydrangeas are glorious. Thanks for hosting! Hi Carol, I don't think I would have noticed any weeds if you hadn't pointed them out. LOL On my post, I pointed out the bare ground. I probably have some weeds in there, too. I enjoyed seeing your blooms, and see my black-eyed Susans are not the only ones that seem to be blooming early, or maybe I'm just thinking it's early for them. Your garden is gorgeous! Weeds? All I saw were beautiful flowers which I enjoyed so much because I'm featuring my nearly dormant summer garden. I love this time of year in the garden. Glad you're having a good weather year. Thanks for hosting! Happy more normal summer to you! We're having splendid weather here in the Pacific Northwest. I love the names you have for various areas of your garden which looks great BTW. Thanks for continuing to host GBBD & and I hope it's a happy one for all! I loved the walk through your garden! Especially love the thought of stopping for a bit to sit in the great green chair and take it all in, glass of iced tea in hand! Many thanks for supporting this meme. I enjoy seeing everyone else's garden, its like taking a mini tour! Thanks for hosting again, Carol! So many beautiful blooms! I was pleased to see the corn - I think my own is only a week or so behind yours. thanks for hosting Bloom Day, Carol! Yay for rain and normalness! Normalness around here (Portland, OR) means no rain this time of the year...but at least there are plenty of blue skies. There are worse things to be called than a "crazy gardener":) Happy Bloom Day! Love to see your tiger lily. The banana also looks good in that container. Thanks for hosting. It's my first time joining GBBD. I didn't notice a single weed, your blooms look so nice! Thanks for hosting another GBBD, Carol! I love poking around all the other posters' sites to see what people have growing in their own gardens. I like your 'Little Joe' -- mine has never done much for me, I think I'll move it this fall and give it one more chance. Everything's lovely all around, but I especially loved seeing the corn that's about to provide a nice summer treat. Thanks for hosting GBBD. Thanks! Love to see what's growing in so many gardens. Better late than never, my Bloom Day post is up. And a happy Bloom Day to all. I hope you'll visit my garden. I love your big sweeps of perennials, Carol. It's something I can't accomplish in my small back garden, but I do have some sunset-colored offerings for Bloom Day. Thank you for hosting, and enjoy your great weather! Wow, wow, wow! Look at your big, beautiful garden. No one but you is noticing the weeds, Carol. Beautiful as always! 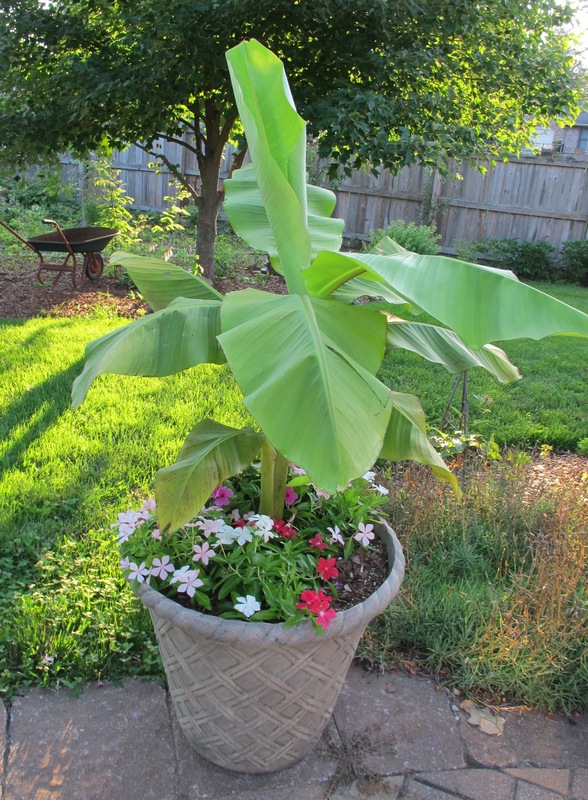 Love, love your banana plant! And that clematis I am going to have to look up. Your garden looks fantastic, as usual. My neighbour has a banana plant, too. Yours looks great in a pot. Your post almost made me feel as though I was there. I really could smell the dill! Anyway, I really like the name "plopper's field," and will, because of your inspration, be naming my garden areas to keep them straight. Thanks for inviting me to your bloom day! Beautiful! 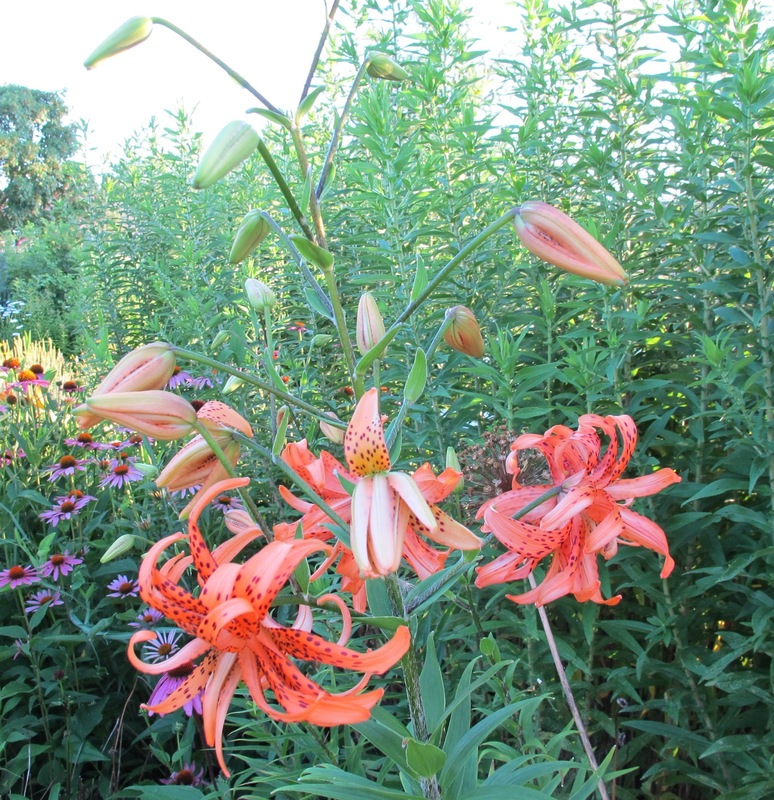 I just love the double tiger lily. Looking good again this July. It's nice when it all comes together. You have such a great variety.I'm glad you are getting rain this year. Here in upstate New York, the day lilies are fantastic and there is just so much in bloom. Alana -Ramblinwitham. Water is such an important garden resource. If it's any consolation, I don't even notice the weeds in your garden-everything looks lush. Happy GBBD! I love your Ploppers Field. Makes you want to be there. Thanks so much for hosting GBBD - this will be my first time linking up and I'm so happy to participate with all of these lovely bloggers! Your garden is spectacular - I'm in love with that clematis, in particular. Gorgeous colour! Better late then never! Loving all the beautiful flowers! Your mid summer garden is looking very vibrant and healthy! Here in my zone 9b garden in Central California, we have had 19 consecutive days of triple digit heat and of course no rain. Yet there are some plants that still manage to bloom! 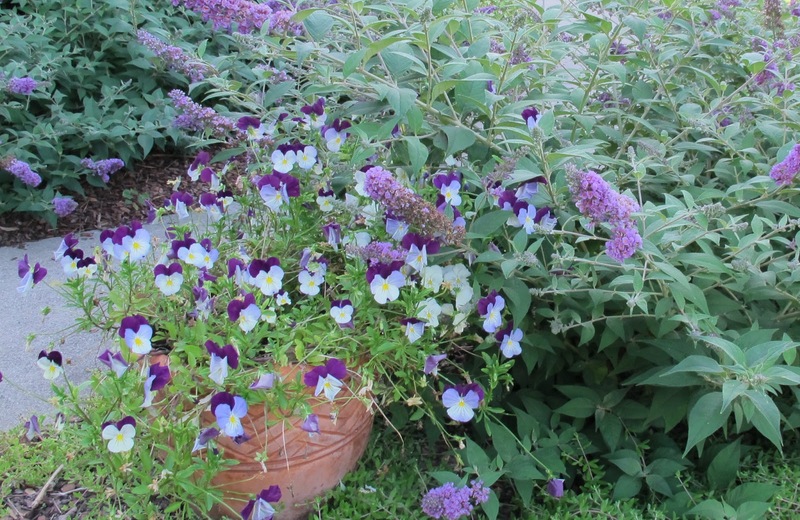 Love the variety of color and the combinations in your garden. Very lovely. Gorgeous flowers! Color me jealous as I am starting a brand new garden and don't have much in the ground yet. Really love your phlox and daisies! Happy Bloom day! Hey, it wouldn't be a real garden without weeds! (At least that's what I tell myself on a regular basis...) I'm impressed that your corn is tasseling out already. In this area, it's only about waist high so far. Thanks for hosting! Your hydrangea & clematis make me sigh but your Plopper's Field makes me laugh. I also tell myself, "let's not go all wild so they think a crazy gardener lives here". Bet there are many of us keeping a low profile in front while the back is up for anything! The main GBBD post just went up, but the list of botanical names for Annie's Addendum will be late. Your garden is looking lush and bloomiferous. 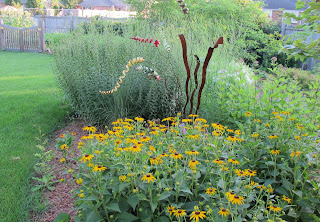 I think I need an August Dreams Garden area like yours; my garden feels like it's winding down for the year or at least in a transition. Thanks for hosting. You have a LOT going on this month. I love that garden art you have sprinkled amidst the flowers. Plopper's Field is gorgeous. Another Bloom Day in the can really, really late at night. Glad to have gotten home to visit my garden for this month's post. For all the blossoms, seems there may be some food coming on in a few weeks. Love your attitude of 'I'll show you my mess if you show me yours'! 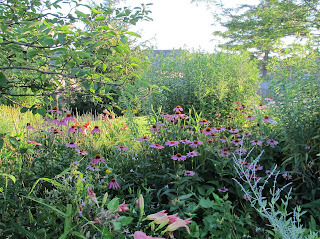 The garden always does seem a bit of a mess in July, but I always thought it was because of our heat here. Makes me feel better to know it's more of a widespread mess. 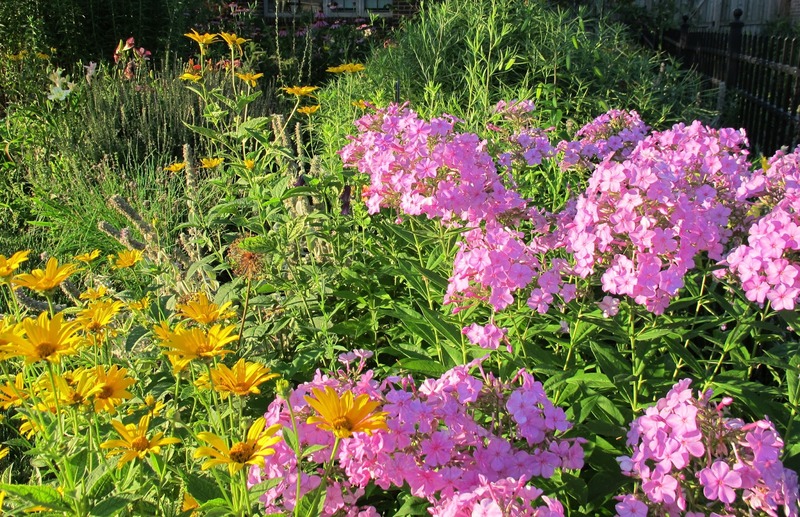 Although, your garden in the phlox 'David' picture looks quite stunning and beautiful. I can see no mess there! Thanks for hosting. With all the rain we've had my vegetable garden is a far cry from past years. I've posted this year and previous years' pictures of my tomato plants for garden bloggers bloom day. So nice of you not to mind stragglers! Thank goodness the rain returned for you this summer. The clems and hydrangeas, everything looks lush and happy. Yael from Home Garden Diggers. Your garden is looking lovely. I love that green Adirondack Chair. I agree: rain is much better than no rain, even if it makes for more weeds. I love that romping clematis! Thank you so much for being such a gracious blogger hostess Carole! So many wonderful blogs to read. Wishing you a great week! thanks for hosting again Carol, you garden is looking great. I love your yard! This is the "perfect garden" time of year. Gardens are ablaze with color and full of life. I'm looking foward to being part of GBBD! Thanks so much for hosting Carol. I love how this is a 'no rules' event. I was feeling guilty for posting a few days late, but your note made me feel much better. I look forward to this each month, and you don't know how much it inspires me! I would love to wander in your garden. It looks like a dream. Thanks for hosting this garden party.